A pro-integration protest in Malta in 2016. If you ever wondered what's really wrong in the state of Malta, then look no further than Net News's reportage of Joseph Muscat's Sunday sermon about the "need" for more foreign workers. In a nutshell, the Prime Minister made his argument why Malta needs to import more foreign nationals to cope with the growing economy. Cue: Net News echoes the Nationalist Party leader's increasingly warped xenophobic statements by inserting cutaways of boat migrants arriving in Malta. I will not bother you with the usual semantics but it's good to know the sheer double standards being played out at the altar of political rhetoric. Muscat says Malta needs more foreigners. He's probably right - the economy is still growing and the Maltese refuse to do certain jobs, especially in the services industry. But why do we need to import workers from non-EU states when the required workforce might actually be present in an open centre close to your office? Why isn't the government dipping into the rich well of refugees who have no choice but to work on the black market with atrocious conditions for greedy bosses who chomp on expensive cigars? The asylum seekers in Malta are not going anywhere anyway, so why leave them rotting away, bored in Marsa or Ħal-Far? Why are refugee women and the disabled left abandoned with no hope to work because they are not being given training or supported to enter labour market? The footage of black migrants landing in Malta... It's quite simple why Net News would choose to go out of point and portray black migrants landing in Malta to tie in with the prime minister's discourse - they simply want to engage with the populist anti-migrant sentiment and portray Muscat as a "klandestini" importer. Us news organisations have a collective responsibility to focus on the black market rather than morph ourselves into Malta's version of Fox News. And yes, I'm also looking at you, TVM! Stop the unregularised market. The government says it cannot regularise hundreds of undocumented migrants living in undignified conditions, and with an uncertain future, despite the fact that most of them are already working, paying taxes and social security contributions. Maybe we should start looking at the many foreigners that do not deserve protection and are instead getting the paperwork to live and work in Malta - simply because they have the financial means and contacts to do so. 2003 anyone? One of the then Labour Opposition's major rallying calls against EU membership in 2003 was the prospect of Malta being invaded by foreigners once it joined the European bloc. Well, to a certain extent their predictions have been fulfilled because the economy dictated it - but isn't it ironic that the same party that warned about biblical invasions is now advocating the need for thousands more foreigners? Because, you know, it's all about the economy, not about human rights. We are xenophobic. And I don't say this frivolously. 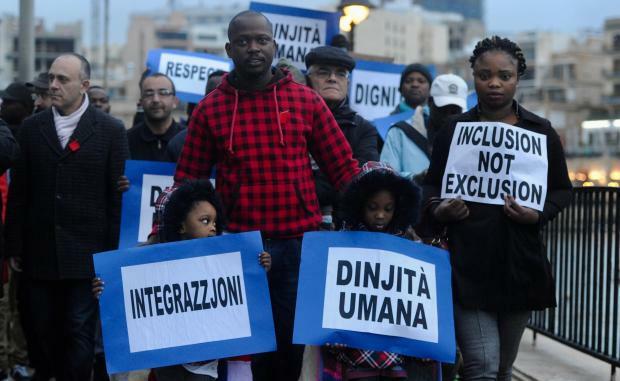 A recent report showed that a quarter of Maltese would feel uncomfortable even being friends with an immigrant. Just look around you - why are most construction workers toiling away in the heat, black migrants? Why do we prefer to employ a Filipino nanny rather than a Nigerian one? Why are you almost never served by a black waiter? Just look at the way certain news organisations persist in emphasising the nationalities of foreigners caught on the wrong side of the law. We really do have a major influx, of the hypocritical kind.